It's about love, not death. At the beginning of Lent I stood before the grave of three Maryknoll sisters in a crowded little cemetery in the northwestern province of El Salvador. I'd come looking for Maura Clarke, one of the four church women – Ita Ford, Dorothy Kazel, Jean Donovan are the others--assassinated in December 1980 by the U.S.-supported military of El Salvador. If anything of them is remembered thirty years on it is their deaths: violent and shocking to American sensibilities, they drew attention to the regime's brutal repression and exposed U.S. involvement. The killings were completely of a piece with the death that was being visited on union organizers and peasants' rights activists and lay parish leaders all over El Salvador in those years. They were shocking to Salvadorans only in their sameness. In the frightening autumn of 1980 Maura and her friends found some solace in the verse from John's Gospel: “There is no greater love than this, to lay down one's life for one's friends.” It connected her to The Passion we reenact this week and it bolstered her as she faced the possibility that she would be next. I've been following Maura for the better part of a year. I'm writing her biography. I've read her high school transcripts and the letter she sent seeking entrance to the Maryknoll order. I've talked to nuns who served with her in the Bronx, Nicaragua and El Salvador. I'd catch a glimpse of a magnanimous smile or a flicker of some personality in the fact that she took an art class at Fordham in the 1950s. But she remained elusive, lost behind a habit and the self-abnegating customs of the pre-Vatican II convent. My trip was a pilgrimage of sorts to see where Maura was killed, to understand how a beloved daughter from Rockaway Queens died on a dark road at the edge of the Cold War. On the long bus ride from Managua to San Salvador I tried to grasp what brought Maura to a country engulfed in breathtaking violence against a movement pressing for basic social fairness. Maura spent six months deciding whether to go. She arrived in August 1980, after Archbishop Romero and a half-a-dozen priests and thousands of Salvadorans had been killed. She knew she might die. How did she get from a happy childhood on the boardwalk beside the Atlantic Ocean to this horror show? Now I was at this lonely, dusty, down-at-the-bottom-of-a-hill, beyond a rutted road cemetery, so far from her home. She's buried between her Maryknoll sisters: Ita Ford, with whom she worked and was murdered on one side, Carol Piette, who was drowned in a flash flood a few months earlier on the other. I stood before her grave and made my mind silent. Maybe this is how the women felt that first Easter morning when they went to pay their respects at the tomb and found it empty. I've always liked Lent: the dark days of late winter, the challenge of purification, the hardness, the emptiness, the desert of it. I liked walking into the darkness: the terrible metaphysics of deicide. We tend to focus on the tomb or the cross. At least I do. I thought of Maura's story as a Good Friday story. It was about sacrifice and sin (greed, violence) and eventual resurrection- maybe- in legacy. But in sitting with the people she sat with during her 16 years in Nicaragua and four months in El Salvador, I learned that Maura's story – and the Christian story she died for – wasn't about penance and agony. It was about love. 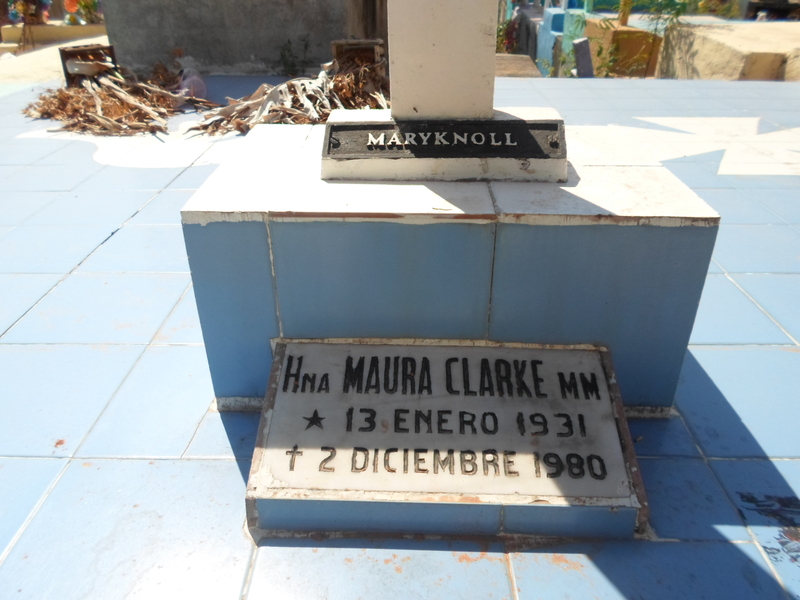 I found Maura on my trip to Central America, but not at the cemetery and not even at the site where her body (and those of her friends) was discovered in a shallow grave. I found her in a Salvadoran woman who said she was alive because Maura took charge when the death squad came for her. Mercedes Monge spoke of fear, but also of teaching Maura to make pupusas, of picnics and swimming and singing. I found Maura in the old gold mining town in Nicaragua where three proud middle aged women told of how Maura noticed their intelligence when they were poor, country, 12-year-old girls and trained them as teachers. I found her in Doña Miriam and Doña Maria Louisa and a score of others who sat in threadbare living rooms in unfashionable neighborhoods of Managua and talked of love. Dona Miriam's round face glowed when she remembered the women's retreats Maura invited her to in the 1970s, the joyful Base Christian Communities she helped form, the growing sense of self-respect, the comprehension that God loved far more than God judged. Maura and the sisters she worked with taught oppressed people that they were loved, that they were worthy, that God wanted for them happiness, not suffering, another woman said. No one remembered Maura thirty years later because she was the most pious or the most correct. People didn't hang her picture on their plaster wall or name their daughter after her or wipe away tears even as they smiled at the mention of her name because she was the most severe, the best at self- flagellation, the most familiar with the desert. They caressed her memory because she visited with love. When Maura talked to you, you felt beloved, person after person told me. She walked into cardboard slum shacks in Nicaragua and terrified villages in El Salvador and addressed individuals with a disarming, open kindness. It turns out that's what the story is about. Not death and torture – on a cross or at the hands of a military junta – but warm, flowering, life-giving love. UPDATE: A Spanish translation of this post is now available. CORRECTION: An earlier version of this blog stated that Carole Piette died in a car accident. In fact, she was drowned in a flash flood. Was "self-flagellation" a Maryknoll practice? Was "the desert" a Maryknoll metaphor? The point with the mention of sefl-flagellation, etc is that these were specifically practices NOT followed by Maura or the other Maryknoll sisters, they pursued holiness by other means. It wasn't as clear to me as it was to you. Earlier in the piece the writer said, "But she remained elusive, lost behind a habit and the self-abnegating customs of the pre-Vatican II convent." What were the "self-abnegating customs" Maura participated in as a young religious? If "self-flagellation" was not one of them, why say she was not the best at it? She was not the best or the worst at it, if it wasn't done. A beautiful and well-written piece, Eileen! Sterling story. Communion and Liberation will be more credible when they press for recognition for Maura. It is the shame of John Paul II and Benedict that they ignored her. Maybe Francis will acknowledge her and Romero. Certainly she is risen along with Jesus. A blessed and inspired memory. I doubt the Holy Father would want bring to mind the contrast between those who defended the poor and those who cooperated with military juntas. Thanks a lot for this inspirational, hopeful and incarnate piece! !